When Sandy Alderson became general manager of the New York Mets, his plan was to build a competitive team in the short-term while creating a great minor league farm system in the long-term. While the former hasn’t happened the ladder is actually coming together. The Mets farm was ranked in the mid-20’s when Alderson and company took over. In Keith Law of ESPN’s bi-annual prospect ranking he ranked the Mets farm fourth best in all of baseball. In Law’s top 50 midseason prospect rewrite (Insiders Only), four Mets prospects made his top 50. Noah Syndergaard (16), Michael Conforto (32) Brandon Nimmo (34) and Dom Smith (49) all made Law’s top 50. Syndergaard has had a rough year in Triple-A. His ERA is over five, he has spent time on the disabled list, and there is a chance now that we don’t even see him in the majors this season. That being said in the extreme hitter friendly PCL him just racking up innings has to be seen as a positive. Syndergaard is actually only 21 and seems to get better every time he advances a level with exception of this season of course. He should be fine and compete for a rotation spot early next season. 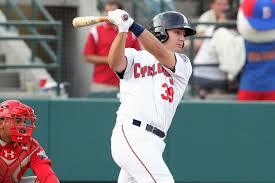 LF Michael Conforto made his professional debut for the Cyclones a few days ago. Unlike other top picks in the Sandy Alderson era, Conforto is expected to reach the big leagues rather quickly. Some have even predicted he would be the first from the 2014 draft class to reach the majors. While I wouldn’t go as far to say that since the Mets are generally much slower at advancing their prospects, Conforto should provide the Mets power rather soon. Brandon Nimmo is the surprise on this list. He was constantly compared to all-star starter Jose Fernandez after Miami selected their flamethrower one pick after the Mets selected Nimmo. Nimmo didn’t show much power until this season when he escaped Savannah. Savannah’s park has always seemed to zap left –handed hitters of their power. Nimmo is hitting .282 along with a .411 OBP, nine homers and 40 RBI in 92 games between High-A and Double-A this season. Nimmo looks like he can legitimately contribute in some way to the Mets next season. Lastly Dom Smith has also performed well against older completion in Savannah. The first basemen is hitting .299 with a .357 OBP in a tough place to hit. Like Nimmo it wouldn’t surprise anyone if he breaks out “power wise” next season when he gets away from the Sand Gnats. It is very surprising to me after all of these years that three of the Mets four top prospects are now position players. The Mets are going to need to continue to develop these guys to help fix what is currently a poor major league offense. Conforto, 21, batted .351 this season, his junior year, with a .506 OBP and .557 slugging percentage and is a two time Pac-12 Player of the Year. 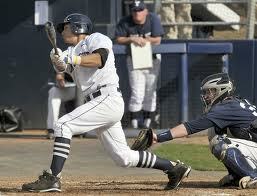 He is also a finalist for the Golden Spikes award, which is awarded to the best college player each year. Conforto doesn’t have the upside of former Met first round picks like Dominic Smith and Brandon Nimmo but he should be able to move through the minor league system quickly. 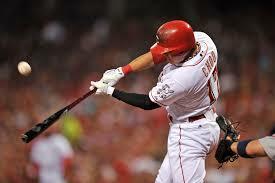 He projects as a middle of the order bat who should be good enough defensively in left field. The Mets can probably hide him in left field. As long as he hits it should be a good pick. The Mets were deciding between Conforto, college SS Trea Turner and Hartford LHP Sean Newcomb. Conforto brings something that not many teams in baseball have, left-handed power. Mets scouting director Paul DePodesta was thrilled that Conforto was available to the Mets at 10. “This is a pretty polished college player” DePodesta said after the pick. 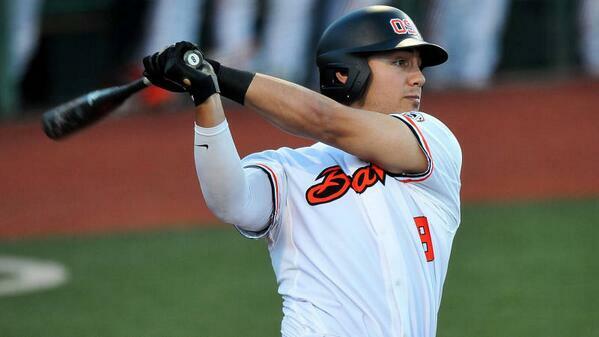 Of Sandy Alderson’s four first round picks as Mets General Manager, Conforto was the first college player selected. All four have been hitters but none are all that close to the big leagues. The Mets will likely send Conforto to the Brooklyn Cyclones should he sign his professional contract quickly. 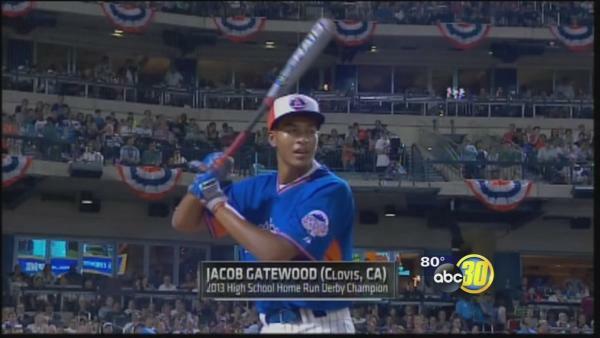 What do you think of the Mets first round pick? Who should the Mets take first in the 2014 MLB Draft? Today on BrokeMets.com, we have a special treat for all of our readers. Alex Giobbi, of Minorleaguemadhouse.com has agreed to do a guest post on the Mets plan for the MLB Draft next week. Alex specializes in prospects and I highly recommend this article as well as his website. He looks at the track record of Sandy Alderson’s previous three drafts as Mets GM to determine who can be a target for the Mets with the 10th overall pick. What name will Bud Selig call for the Mets on June 5th? 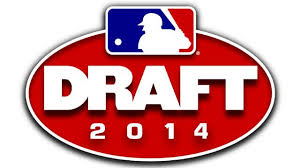 With a week remaining before the 2014 MLB Draft kicks off, the Mets have a very big decision to make. Armed with the tenth pick, which was protected from being lost to a team that let go of a big money free agent, the Mets have myriad options for their next big prospect. Before going into who the Mets should take, let’s take a look at the first round strategy of GM Sandy Alderson. 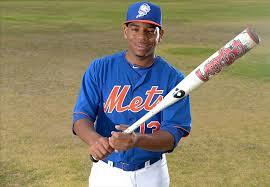 2013: Dominic Smith, first baseman, Serra High School, Los Angeles, CA. Dom Smith is holding his own in Savannah despite being less than a year out of high school. Smith, who was viewed as one of the top hitters in his class, was valued for his stroke as well as his fielding ability. He’s been compared to Adrian Gonzalez, and in a particularly weak year for first base prospects in MLB, he’s ranked second, although he’s made strides to justify that ranking after a slow start in Low-A Savannah. Given the team’s unsurprising trade of former top pick Ike Davis and commitment to Lucas Duda (who will be 31 or 32 by the time Smith makes his MLB debut) it’s almost a certainty that Smith will be playing first base at Citi Field in the latter half of the 2010’s. Cecchini is a big time hit or miss prospect who was taken for his value as a defensive star. Although he’s had a slow start to his career due to injury, the fact that he’s only 20 years old serves as a reminder that high school talent often takes more time to develop, meaning he could conceivably be held in the minors until 2017, much like Smith. Cecchini seems to be destined to make up half of a double play combo with one of two top international prospects: Dilson Herrera, who was acquired in the Marlon Byrd trade, or Amed Rosario. Whomever is the odd man out in that group is either going to be traded or coerced into playing third base. Should Cecchini lose out on the shortstop battle, he could be tried out as a third baseman, in fact, his older brother Garin is a top third base prospect for the Boston Red Sox. Kevin Plawecki has moved through the minor leagues much faster than most anticipated. When Kevin Plawecki was drafted, one of the big things that stood out about him was the fact that he’s a guy who constantly gets on base. A guy who also rarely strikes out, Plawecki reminds some Mets people of Daniel Murphy, except he’s slower and plays a more challenging position. 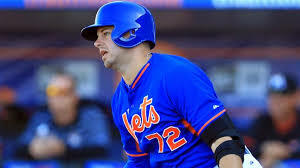 As I’ve made mention before, teams are starting to understand the importance of carrying two starting level catchers on the big league club, and Plawecki with Travis d’Arnaud could actually prove to be a solid combination. Should the Mets opt to deal him, he may have some value for a team that could use a starting catcher, as evidenced by the Mets’ discussions during the offseason between the Diamondbacks. Alderson’s first pick as a Mets GM is either going to be one of the biggest gem finds or a major novelty gone bad. Nimmo, who gained fame for not playing high school ball (Wyoming doesn’t sanction baseball as a sport in interscholastic competition), was valued for his athletic upside. Nimmo has overcome a predictably slow start in the minors and is currently tearing the cover off the ball in High A St. Lucie, enough to land him in the top 100 prospect list at the final spot. 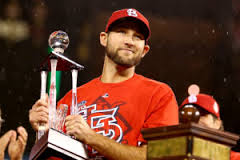 Should he continue that pace, expect him to make a return appearance to the Futures Game in Minnesota. Fulmer is the only pitcher that Alderson has drafted in the first round, and for good reason. 2011 was a great year for Oklahoma prep pitchers, and Fulmer has followed Dylan Bundy and Archie Bradley’s success pattern. Although he suffered a setback from his development after injuring his leg, he should be with the major league club by 2017, likely as a long reliever/spot starter. Sandy Alderson’s strategy deviated from his predecessor, Omar Minaya, who drafted low ceiling/high floor talent. 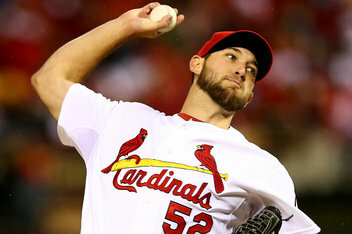 Although most of Minaya’s choices were destined to be average (or in the case of 2007 and 2008 first rounders Nate Vineyard, Reese Havens and Brad Holt, marred with injury and unfulfilled promise) Minaya does have the claim to fame that his final first round pick, Matt Harvey, is one of the best young pitchers in baseball. Moving on, the question remains: Who should Alderson select with the tenth overall pick? Generally, given the amount of time prospects take to develop, coupled with the choice between high school, JUCO and college talent, general managers go with the Best Player Available. Although Alderson didn’t necessarily need a first baseman, and many experts thought he would have gone after a college outfielder like Fresno State’s Aaron Judge, Smith was the best player available. If we went by the best player available based on Baseball America and MLB.com’s top 200 and 100 prospect lists, then the Mets would have two different choices: Baseball America’s #10 player in their top 200 is LSU ace Aaron Nola, who’s bounced up and down the draft board, going as low as the 20’s and as high as top ten. MLB.com has University of San Francisco outfielder Bradley Zimmer as their ten pick. Zimmer has stayed pretty consistent, getting picked in the top 15 in most mocks. First, let’s get one thing abundantly clear: Carlos Rodon will not fall out of the top three. Despite his struggles this year at NC State, Rodon’s still got an impressive resumé, as well as covetable attributes that will make him a top pick. 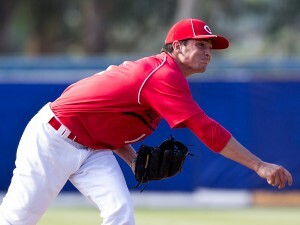 The same goes for Brady Aiken, the prep star from Cathedral Catholic. His stock has risen to the point where he’s in the conversation to be the top pick as well. That, and they are also left-handed pitchers. Tyler Kolek, the consensus top right handed pitching prospect, will also not fall out of the top five. In my two mock drafts, I had the Mets taking a right handed pitcher for the reason stated above: They will need to add a right handed pitching stud in order to balance out their top ten prospects. In the first mock, I picked Touki Toussaint: a high school arm whose raw talent, coupled with his loose arm could make him a deadly young pitcher with #2 starter potential. However, given Alderson’s Moneyball background, which actively discourages the drafting of prep arms in the first round, the chances of Toussaint wearing a Mets jersey seem slim. In the second mock, I had the Mets taking Tyler Beede. Beede is a familiar name, as he was a first round pick three years ago by the Toronto Blue Jays. However, Beede decided against going pro and went to play for Vanderbilt. Beede’s game is great, but some mechanical fine tuning could make it better. He’s been consistently challenging both Nola and Rodon as the top college pitcher this year, and his Golden Spikes nomination last year indicates he has high level pro potential. If I were Alderson, I’d want a battle tested pitcher, a pitcher that has faced top flight competition. Right off the bat, that eliminates Toussaint and Grant Holmes, a big pitcher from Conway High School. Because high school baseball talent is relative to the state that it’s played in, even if Toussaint and Holmes were among the best talents that year, keep in mind they were facing typical prep talent. Not every South Carolina and Florida prepster is going to play division one ball in college, and even if they did, they wouldn’t all play in the power conferences like the SEC or the ACC. The second aspect of a battle tested pitcher is the college conference they play in. The Mountain West and Conference USA, once upon a time, were college hotbeds, but now they’re essentially a tick below the real power conferences. Sure, pitchers like Hoffman and Fedde may get the opportunity to play a power conference team here and there, but ultimately, unless it was consistent, it’s a waste of time for Alderson to even think about Fedde and Hoffman. This leaves it to two pitchers: Nola, and Beede. Nola, the ace at LSU, is a pitcher who, while he isn’t going to blow you away with any special pitch, has great command and control of his offerings. He won’t be an ace at the major league level, but his dependability will be an asset to any team that needs a pitcher who can go deep into innings. Beede, on the other hand, is an anti-Nola. His fastball is his best major league offering, going from the low to mid 90’s, and his ceiling is a front-end starter, possibly as high as #2. What Beede lacks in his game is pitch consistency. While Beede does have devastating offerings, like his fastball, curve and change up, they are only effective if he can consistently locate the strike zone. So who should Sandy pick if it comes down to Nola and Beede? In a perfect world, Nola will fall to the tenth spot where Alderson can nab him. His consistency and even strength in his offerings mean that either he’s going to be an above average hurler with little to no need to tinker, or, if there is room for improvement, establish a dominant pitch or make each pitch better. Nola’s mechanics are excellent and he is battle tested against the highest possible level of competition in college baseball. It seems that Nola is one of the very few high ceiling/high floor talents, and although Alderson isn’t the type of general manager who goes for safe picks, getting that combination will pay off rather quickly. Thanks again to Alex for this fantastic post and make sure to check out his website Minor League Madhouse. He has all of your draft needs covered. The Mets currently at 64-78 and have the 7th worst record in baseball. Last year the Mets finished with the 11th overall pick and it drastically changed their free agency plans. The team wanted to sign Michael Bourn but refused to give up their unprotected 11th overall pick to sign him. A similar situation could be upcoming as the Mets wrap up another tough season. Only the top 10 picks are protected and the Mets will not sign a premiere free agent if they finish with an unprotected pick. While the Mets are probably thankful they didn’t sign Michael Bourn last winter, they would like to sign a bat or two and that could cost picks should they be offered a $13 million dollar qualifying offer by their former teams. As of now the Mets will have their pick protected with the 7th overall pick but their are still too many games left to be sure. It is in the Mets best interest to have a “top 10” worst record going into an offseason where they plan on spending free agent dollars. I am not in anyway saying the Mets should tank but a hot streak to end their season, (while not likely) isn’t in the team’s best long term interest. Definitely something to keep an eye on. To keep track of this situation check out MLB Trade Rumors Reverse Standings Page which is updated everyday. After selecting 1B Dominic Smith in the first round and pitcher Andrew Church in the second, the Mets went with a few more high schoolers with their next few picks. With the Mets second third round pick (#84 overall) they took Casey Meisner, a righthand pitcher out of Cypress Woods High School in Texas. He is 6′ 7″ and 190 lbs. Meisner has a nice arm but it may be difficult to sign him away from a commitment to Texas Tech. In the fourth round (#116th overall)the Mets took UCONN 2B L.J. Mazzilli, yes Lee’s kid. Lee Mazzilli was taken by the Mets in the draft exactly 40 years ago. L.J. Mazzilli wasn’t just drafted for his bloodlines though this kid can play. I got the opportunity to call a few St. John’s UConn games last season and Mazzilli was definitely the best player for either team on the field. Mazzilli, a senior signing out of College, shouldn’t be too hard to sign. In the fifth round (#146th overall) the Mets took Jared King, a leftfielder and switch hitter out of Kansas State University. King is listed at 6′ 1″ and 200 lbs and is 21-years-old. King can hit for average and power, according to reports. As a sophomore at KSU, King hit .377 with 15 doubles, seven home runs and 47 RBI in 56 games. “I thought he was at worst a third-round pick,” MLB.com’s Jonathan Mayo said of King. He was listed as the 68th best prospect by Baseball America. The Mets first few picks clearly show what Sandy Alderson, John Ricco, Paul Depodesta and J.P. Riccardi have been doing with their drafts and that is constantly picking upside over “project ability”. The Mets picked guys who may not be in the big leagues for five years, but if they make it they could be stars. Smith looks like he could be a star first basemen but not for a very long time. I think Keith Law said it best when he said this Met regime likes drafting athletic kids and teaching them how to play baseball. Ivan Wilson is still learning how to play baseball, but he could be a dynamic outfielder down the road. Now here comes the tough part and that is signing these guys. The deadline is July 15th to sign these guys or they will no longer be Mets property. The team has $6.99 million to spend on the first ten rounds. Then they will try to sign them as soon as possible in an effort to get them into professional baseball games this year.